The Red-legged frog is a medium-sized brown to reddish frog, with smooth skin marked with small, irregular black freckles. Males reach approximately 7 cm in length, and females grow to about 10 cm. The Red-legged Frog has long, slender hind legs and prominent dorsolateral folds running from behind their eyes down the sides of the back. They usually have a dark mask and a light upper jaw stripe running back to the shoulder. The most distinctive trait of red –legged frogs is the red coloration on the underside of their hind legs. 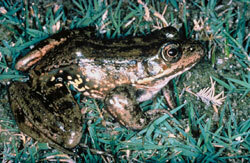 Red-legged frogs mate and lay their eggs in late winter or early spring in coastal areas. They prefer shallow, slow-moving streams, ponds or marshes for breeding. Males call to attract females, usually from under water, so the call is often low-pitched and stifled. Females lay eggs in large, jelly-like clusters of 750-1300, and they attach the clusters loosely to stems of submerged aquatic vegetation. Embryos develop and hatch in about four weeks and then spend four to five months in the tadpole stage. Tadpoles metamorphose into tiny young frogs and are only a couple of centimeters long by mid midsummer. Red-legged Frogs are thought to take three or four years to become sexually mature, and they have a life span of up to 13 years. Adult Red-legged Frogs prey on insects and other small invertebrates, which they hunt along the edges of streams and ponds. Tadpoles graze on algae.